Agile Management Consultant, Agile Holland Co-Founder/Treasurer, Professional Enthusiast. Hand lettering, sketchnoting, graphic recording, podcasting, writing. 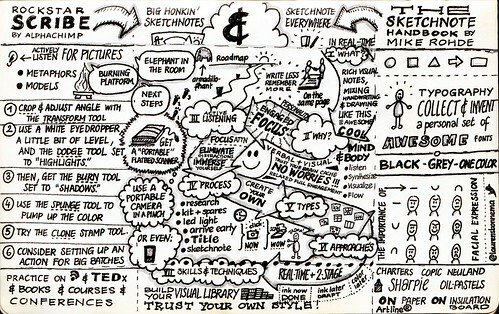 I discovered sketchnoting when I stumbled upon a post in my daily dose of RSS feeds. In that post, the author - can't remember who it was - described an awesome way to take notes that rather resembled the way I had been doing mind-maps wrong. I felt liberated: Now, I was no longer bad at mind-mapping, but apparently pretty good at sketchnoting! As soon as I started sketchnoting, people around me took notice, and started asking me to teach them how to do it. I was amazed, and pleasantly surprised, as I'd expected at least some people to respond negatively to it. To date, no one has ever done so. In fact, everyone that has seen my sketchnotes, be it a colleague, client, or competitor, has complimented me on it, and asked me to show them some more. This has had a profound effect on my work. Now, I swirl my private passions for hand lettering, sketchnoting, graphic recording, podcasting, and writing into my day-job as an Agile Management Consultant. That allows me to maximize the awesome in my work. And that's fun! I prefer analogue sketchnotes, because I like the feel of pencil and pen on paper. That said, I did get me one of those iSketchnote thingemabobs to allow for easy digitization and animation. And I've written a short shell script to vectorize scans of my analogue sketchnotes. Start sharing your work before you think it's awesome. You'll be amazed by the response! I see a bright future for sketchnoting, graphic recording/facilitation, and visualization in general. More and more people are showing interest, both as a hobby and for professional purposes. What I love about the Sketchnote Workbook is that it builds on the Handbook with lots of practical examples. But, I'm biased, because much to my surprise, Mike Rohde decided to include some of my drawings in it. We thank you Laurens for sharing with us.